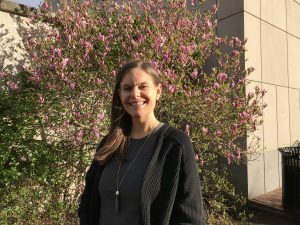 Experience: Courtney is a licensed graduate social worker and has worked with children and adults in a variety of clinical settings, with a primary focus in mental health. Prior to embarking on her social work career, Courtney worked for the Discovery Channel as a digital producer and was involved in marketing and development for the network. Why did you begin Thinking Organized? Working as the Operations Coordinator at Thinking Organized is the perfect role for me! It allows me to utilize my communications and administrative skills (I love excel sheets!) while working for a clinical practice that does meaningful work with children and families. What has been your greatest personal and/or professional achievement and why? My greatest personal and professional achievement has been graduating from CUA with my Master of Social Work degree. Looking back, it was a huge decision to switch careers and enroll in graduate school full-time. I couldn’t be happier with my decision and have gained invaluable experience working as a social worker. I like to think my social work path led me to Thinking Organized! What interesting fact would your clients and colleagues be most surprised to learn about you? I am typically a cautious person and my friends and family laugh at me for getting scared so easily. However, when I was studying abroad in Australia during my junior year of college, I went sky-diving and bungee jumping in the same day, and lived to tell the tale!